Having a tour of a smokehouse might not be everyone’s cup of tea but I’d been badgering Jason of Salmontini for a visit since last November. Partly because of the story behind it – his Dad had started the business in Beirut smoking five fish a week on their balcony in a home-made smoker made out of a cupboard due to the introduction of a huge tax on smoked goods (which he was then importing). Partly also in awe that someone could actually be bothered to fly fresh Scottish salmon to Dubai and smoke it here and make it taste absolutely sublime. Finally because I was refused entry to a kipper smokehouse in Craster – “against rules and regulations you know. We supply Waitrose.” Yes the inner rebellious teenager in me is alive and kicking; if someone says I can’t do something it makes it even more compelling. So here I was on an industrial estate, not improved in any way by being in a place called ‘the Green Community’, meeting the next generation of Bassili salmon smokers. I had some vague romantic vision in my head of wooden sheds with large dangling creatures suspended in the smoky gloom. Of course it was nothing like that, gleaming white surfaces and modern machinery, but even more impressive when you get down to it. First I met the fish. Three year old handsome beasts with a sharp-toothed snarl and a gleam in their eyes. It’s the gleam that’s important. From being shuttled off this mortal coil (by a humane and instantaneous method) to arriving in Dubai is around three days. In fact it takes longer for them to get to the markets in Paris (as they go by road haulage). These glistening creatures stared up out of their bed of ice looking like they would jump up at any moment. Most of the six tonnes had already been cleaned, heads, tails and backbone removed by hand, each salted by hand with rock salt and were in the curing rack, the moisture gently leaching out of them. One batch was already in the smoker, the flesh gently permeated by the scent given off by the oak chips (sent from German forests). I’d expected to see the fish hanging but the shelves and air flow are designed so that there is a very even smoke. The Bassili family have become good friends with the German manufacturer of the smoking machine, ‘Mr Reich’, over the last 20 years and visit each other’s homes. Salmontini usesa simple smoke, Jason says they are confident of the taste – heavy smoke usually disguises faults in the fish. The next room was bright and clinical, like a huge operating theatre. Gowned and masked people worked in hushed concentration, using fine pliers to extract tiny bones, scalpels to remove the smallest of imperfections and long straight filleting knives to slice the smoked salmon flesh into the finest, even, transparent pieces. They even remove the first domed slice (called the pinnacle) which absorbs more smoky flavour than the rest of the fish; (later I checked Jason’s recommendation that it tastes great accompanied by Scottish single malt whisky (I tried a very peaty Kilchoman). It does.) 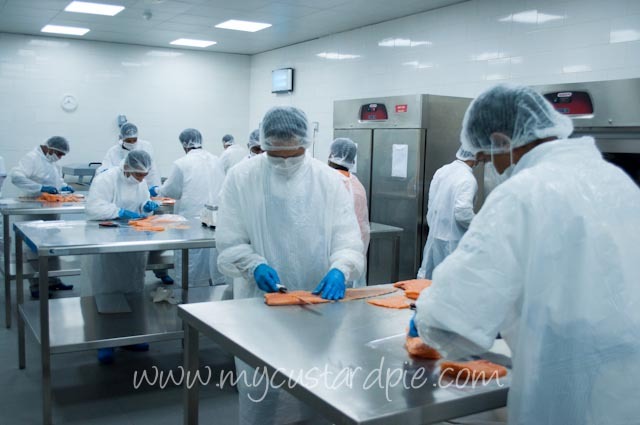 Finally, the slices of fish are interleaved with nylon and vacuum packed – by hand of course. There is an Arabic word ‘zelcher’ which translates as ‘fishy stink’ which is produced when the fat of the salmon converts in to oil. There was not a trace of fishy smell anywhere in the smokery – it was hard to imagine that there was fish in there at all, despite visual evidence to the contrary. I met Jason’s Dad Joe Bassili, who started his fish-smoking apprenticeship in Beirut in 1992 starting with trial and error methods on his balcony with pipes and a cupboard, controlling the smoke with wet towels. He then spent several months in the Shetland Isles of Scotland working with a couple called Debbie and David who had a traditional stone smokehouse where he learnt the traditional process from start to finish. Their smokehouse no longer exists and production of smoked salmon in Scotland is largely mechanised or fragmented. Richard Lochhead, Minister for Food, Drink, Agriculture, Fish and the Environment in Scotland commended Salmontini for continuing Scottish traditions and pronounced their salmon the best he’d ever tasted. From selling five fish a week, Salmontini now import twelve tonnes into Dubai and Beirut. It’s the understanding of the smoking process and care and attention to detail built up through years of experience that makes Joe a bit rueful and dejected when he talks about the current market conditions for smoked salmon. Some products retail for the same price or less that he buys his unsmoked salmon. 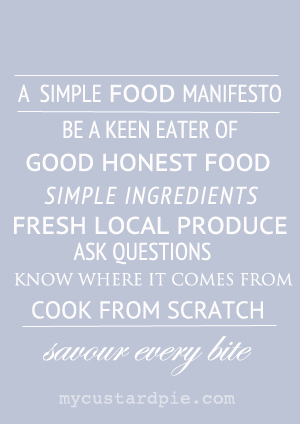 Many chefs understand the taste and quality, but it’s surprising which five star properties choose the cheapest option. Does all this make a difference to the taste? Jason, very kindly, sent me off with a generous quantity of Salmontini smoked salmon. The first difference is the smell, or lack of it. The metallic, oily scent, the product of the fat converting to oil, simply isn’t there. It just smells fresh and smoky. The texture is silky, again lacking any trace of oil; I usually coat smoked salmon in a mass of lemon juice to cut through it but was happy to eat this unadorned by anything. The taste is light and fresh with a subtle smoke – it kept luring me back for more and I ate an inordinate amount in one week. Some I took to a Fooderati Arabia wine evening disappeared quickly; the clean flavours were an ideal accompaniment to our varietal tasting of Chardonnay. I took blinis to a friend’s house where her husband ate the lot on the spot. True artisan food producers are rare in Dubai and I came away with enormous admiration for Joe, Jason and the other highly skilled workers in their small operation. They run a modern operation, seeking to produce the absolute best that they can, using 100 year old methods. There’s a passion, an almost obsession, that seems to unite all artisans. Jason says he eats smoked salmon every day. Open the fridge of a Lebanese person and you will find smoked salmon – it’s as essential as eggs; I now understand why. This was my first try at making blinis – I thought you needed a special pan and the whole process looks complicated. You don’t and it isn’t. The batter was forgiving – after the overnight ferment I dashed in and out of the house doing the next stages between teen social life drop offs. The recipe recommends horseradish cream but I wasn’t aware that you could get fresh horseradish in Dubai then (I now know you can thanks to the Rivington Grill chefs) and to be honest this quality of smoked salmon needs simple accompaniments. I used labneh, a kind of yoghurt cheese popular in the Middle East, which was perfect (no need to add lemon). I followed a recipe from All You Can Eat by Tamasin Day-Lewis which you can find here (scroll down). A scant dessertspoonful of batter was the right amount for a bite-sized blini. They buy them whole so they can check for freshness. The heads and backbones are taken by the staff to make soup. Smoking for 24 hours, then resting for another day and a half means that the smoke permeates evenly through the whole piece of fish. Salmontini smoked salmon is available in Dubai from Carrefour Hyper Markets, Choitram, Lifco and Jones the Grocer. They also have restaurants in Beirut and Dubai (overlooking the ski slope) which serve signature salmon dishes, steaks, salads and a range of bistro-style dishes. Since the publicity (in 2003) surrounding a study that pointed to high levels of carcinogenic chemicals contained in farmed salmon from feed, environment and treatment against parasites, I have rarely eaten it. I voiced these concerns to Jason who talked me through the life cycle of the farmed fish bought by Salmontini. In brief, they source from a small trusted producer where the stages of the fish development mimic conditions in the wild; very different from highly industrialised bulk farmers. The eggs are hatched in pure clean water, then they are introduced to saltier conditions as they grow before being released into vast nets in a loch. The natural currents purify the nets and keep the fish moving (so they are fitter and leaner). At the age of a year and a half they are given one injection of anti-biotic against sea-lice and are not harvested until over three years old (unlike most Norwegian salmon which have higher fat levels due to the colder water conditions and shorter lives at two years old). Beacons in the loch scare away predators such as seals. Their food contains vegetable oil (rather than contaminated fish oil slammed in the earlier report). The ‘swim ashore’ method where the fish swim into pipes and are killed with a blow on the head and a simultaneous spike in the gills, is humane and keeps stress to a minimum. While the debate about sustainability and safety continues, it’s clear that not all farmed salmon is the same and that Salmontini sources from a high quality supplier. As demonstrated time and time again, the demand for cheap food available all year round has had a negative impact so it’s best to buy the best you can. Have you ever made blinis? How do you like to eat your smoked salmon? Have you got a view on farmed vs wild? Superbly informative as always. 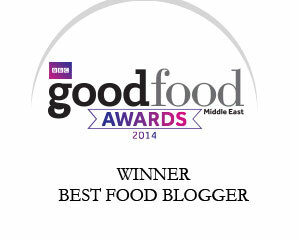 Who knew the Lebanese are as crazy about smoked salmon as Scots! And it’s probably just as well Craster turned you down or you might not have found these brilliant chaps. I admire your persistence. I really enjoyed reading this article, the dedication of true artisan producers are admirable (though it is also daunting to think how much time is needed to learn a craft really well, and the differences between the home cook and real professionals). We may be going to the Hebrides in Scotland later this year, hopefully we will have the chance to sample the seafood. Thanks for giving us the inside story on Salmontini, Sally! Never would have guessed… loved learning about the whole smoking process and I’m definitely going to look out for their products in the supermarket. Always inspiring and adding value to our lives, Sally – thank you! Honestly my most favourite smoked salmon ever. Flavour, texture are superb I agree. The thing that I loved the most about Salmontini when I first met Joe & Jason, is actually learning that they are Lebanese! Found that really interesting. I adore Salmontini smoked salmon. The lovely picture you just painted about the artisan love and care taken to produce it, makes me appreciate it even more. Fabulous food writing Sally! A great place and lovely post! 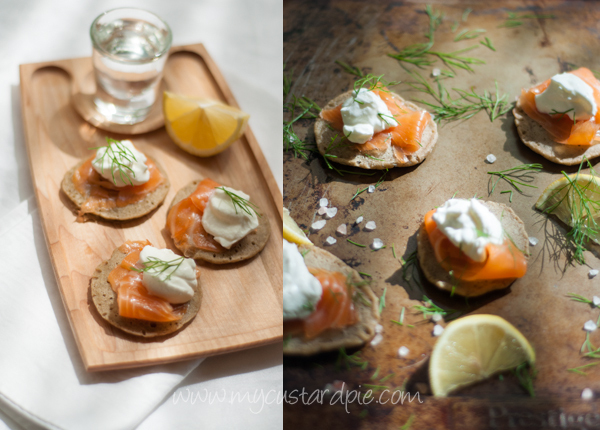 Smoked salmon is ever so delicious… Perfect with blinis. Fascinating and wonderfully written brought a gleam to my eye! badgering again you rebelious teenager? You are always sharing so many wonderful things with us Sally. Would have loved to join you for a day like this. Really enjoyed reading this post Sally. Jason got in touch last week to schedule a visit, so I’ll hopefully arrange to go in the summer when it’s a little quieter. On the other hand now that I’ve read your post, there doesn’t seem much point as you’ve painted such a good picture 🙂 As an aside, my uncle has a smoked trout farm in Wiltshire, incase you’d like to visit one day. What an incredible post, I really enjoyed reading it … your ‘spirit’ shines in uncovering and informing shines through, thank you for sharing! Lucky you getting the visit, I have been badgering Jason for a while too – love their smoked salmon. Most definately my favourite and am glad to see they are widening the distribution channels in Dubai. How interesting! I really enjoyed this post! Fascinating. I rather love the whole process and must write up my visit to one in the Lake District. It’s just amazing how the flavour changes. Lovely blinis too. Perfect on a sunny British Bank Holiday like today! I would definitely be excited too about a trip to a smokehouse. Guy made me a hot-smoker from an old bread bin that we use outside and take to the beach on holiday to smoke mackerel. Lovely though our hot-smoked trout and mackerel are, they’re not exactly the quality you’re describing though! Great informative post as usual. Interesting post, I would love to visit a smokery. 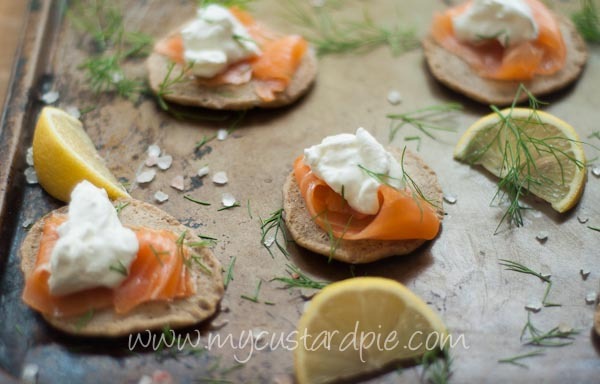 I think smoked salmon is one of my favourite types of smoked fish and the blinis are a great way to show it off. Being from Oregon (part of the US salmon industry) I appreciate your concern about farmed/free salmon. I found the explanation of his suppliers farming process very interesting. I wish more fish were farmed in this more natural method. Thank you. I really felt that fish could swim off! I’ve since seen other people slicing smoked salmon and realised how inept they are compared to the Samontini staff. I don’t pretend to have all the answers here to farmed salmon – there is a lot of conflicting information online and I’m sure it’s not cut and dried. This sounds like a fascinating day out and those blinis look incredible! What a wonderful ‘exposition’ and passion. 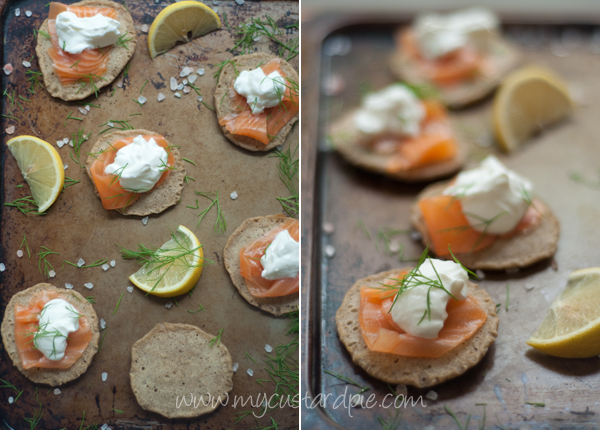 I love smoked salmon with blinis, sour cream and some coriander (I’m not the greatest dill fan, for the classic version). Lovely photos too. I would be very happy to visit a smoke house, thanks for all the interesting information. Smoked salmon with brown bread, thinly sliced onions and a squeeze of lemon, my favourite! What a great article Sally! And how different to my experience visiting Brown & Forrest smokehouse in Somerset last year – two teensy dark rooms (also on a light industrial estate!) and one man with a passion, together with his small staff. It was utterly fascinating, and their produce was phenomenally good. Love the blinis – I am encouraged to hear that it is a forgiving recipe!! Informative article – brought back memories of eating smoked salmon on a bagel in NY city. Thanks, too, for visiting my blog. Fascinating post. Strange, but I never imagined a salmon smokery in Dubai. 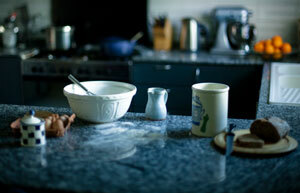 I shot a feature at Forman’s, in London, some years ago for the now defunct “Taste” magazine in the States. Very pleased to have found your blog, and thank you for following mine. Extremely informative post and it makes me realize I haven’t had their salmon in ages. I absolutely adored Salmontini’s heart of salmon when I last tried it – so buttery and lush. Thanks for shedding light on how the fish are farmed and the smoking process, only you could do such a brilliant job of unveiling the behind-the-scenes thought and labour that goes into this intricate operation! What a long and thoughtful post, touching on so many issues. I too, had a romanticized version how people smoke fish. Growing up in British Columbia, our next door neighbor smoked salmon he’d caught in a converted refrigerator in his backyard. All went well until we noticed a piece he gave us was crawling with maggots. It was already on our dining room table. I stick to purchased wild smoked salmon. But if this version was available in California, I’d buy it. What an experience Sally, I would so love to visit a smokehouse. It is all so very fascinating. How wonderful that he is keeping a Scottish method alive over there. I bet that salmon was tasty, I’m a bit of a snob when it comes to Salmon, I only like the best quality cos otherwise I will be unwell after. Very strange. 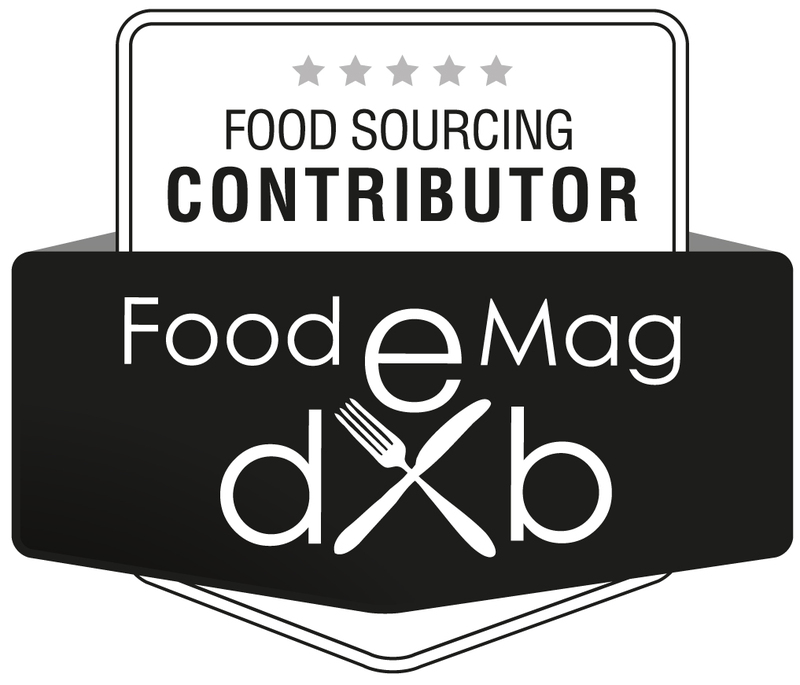 Lovely to hear about artisan producers in Dubai, and great of you to feature them because I’m sure it changes the views people have about Arabia. I think blinis should be next on my list for Friday nibbles. I don’t get on with fish….but I am sure I can find something else to top them with. So simple to make – can’t wait to see your pics if you do. Wow great informative post! Love salmon so I will check this out!